The Weber Q1200 gas grill stands out in the segment of portable grills for a lot of reasons. It’s not easy to survive in this supremely competitive market merely with a strong brand reputation. This Weber is an upgraded version of the Weber Q120 and is mainly targeted at tailgaters, campers, and outdoorsmen. More often than not, portable grills compromise functionality, giving more importance to the space-saving aspect of the design. Fortunately the Weber Q1200 continues the tradition of great grills made by Weber and the portability of the design gives it an edge over some of its competitors. Check out why this is a cracking BBQ below. It has plenty of cooking space for the average family with a cooking surface of 189 square inches. A solid cast aluminum design, made to withstand the wear and tear of time. The material makes it portable while being strong and practical. The porcelain coated cast iron cooking grates steadily hold the temperature for long. Has a decent output of 8500 BTUs. The electronic ignition push button makes starting the fire easy-peasy. The temperature control valve lets you regulate the temperature quickly and conveniently. To keep the cooking area mess-free, it comes with two foldable side tables as well. Has a tall lid for roasting. That’s the first thing anyone looks for when buying a grill, isn’t it? Many portable propane grills do lack the output and temperature stability of standard sized grills. That’s where Weber Q1200 excels. It heats up fairly quickly with the top down so that you can get cooking sooner on the 189 square inches of cooking area which is enough to cook a sumptuous spread for a medium group of people. The stainless steel burner and porcelain coated cast-iron grills help to create a high temperature in a short span and uniformly distributes the heat under the cooking surface. The second most important thing after the performance. The very reason behind buying a portable grill is to get rid of the hassle of complicated set-up. How’s this! The Weber Q1200 comes assembled in the box, no more complicated setup just get it out, hook up the gas and basically you are good to go. The Weber Q1200 will make grilling a breeze with its push button piezoelectric electronic ignition for instant starting and heating up. You don’t have to worry about piling up charcoals or getting lighter fluid in the middle of a hiking trip. The gas grill really does make barbecuing simple and enjoyable. With the temperature control valves, you have full control over the heat for trying different things like smoking, grilling, caramelizing and searing, roasting and fish as well. The grill does not come with a propane tank (most gas grills don’t) so make sure to buy one separately before getting started. Weber claims it to be one of the most portable gas grills in the market right now. The unit only weighs around 29 pounds so whilst it is not a light weight, it can easily be managed by 1 person for transportation. The Q1200 is easily transported in the back of a car to take on picnics or camping. The rigid cast aluminum body makes it sturdy and weather resistant. If taken care of properly, it would easily last you for years. It has a taller lid than its predecessor which is a bonus for cooking a leg of lamb or roast chicken. It comes with two fold up shelves to keep all the cooking instruments and utensils in place. Well, not much, it’s a great little grill, maybe the only thing would be the fold up side benches are a bit flimsy, that’s about it. 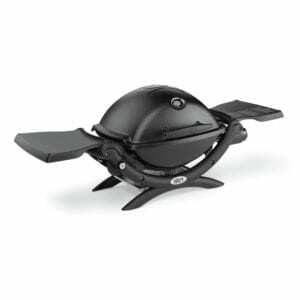 The Weber Q1200 gas grill can be easily taken on road trips, on boats and even used on the lawn and patio. The grilling performance and energy efficiency make it great value for money and it is at home at a picnic or on your back deck. You will really appreciate the ease of handling the machine if you’re not much accustomed to conventional grills. However, the price might seem a bit on the higher side but the design and grilling quality are totally worth it. This BBQ is easy to handle and can produce some amazing meals, perfect for new grill owners or the seasoned pro. Priced at around a couple of hundred dollars it is affordable and will give you a great result time and time again. To see what others have to say about this super popular Weber BBQ and check out the latest deals on Amazon, Click Here. 189 Sq inches cooking surface. Easy starting with electronic ignition. Side tables are a tad flimsy. Trolley is extra. More info here.